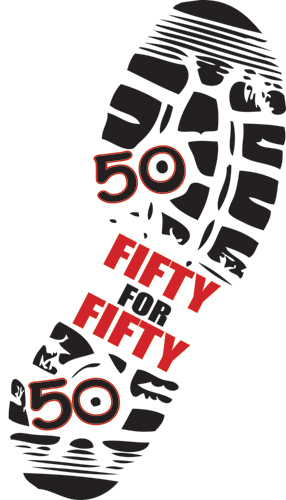 Can a guy turning 50 run a minimum of 50 races in 50 weeks? When it’s for the kids of Easter Seals—absolutely! But can he raise a minimum of $50,000 …..With your help—yes we can! It all started in 1988 and a Gin Rummy Tournament for the kids. I’ve been a friend and volunteer of Easter Seals for over half my life, and I’ve gained so much from working with this unbelievable organization. It is not only the staff, but the 100’s of volunteers, the Kids & their families. Jodi, the girls and I love these kids so much and they are a big part of our life. Next year, I turn 50 and instead of doing something crazy like buying a fancy sports car or jumping out of a plane, I’m going to run. And I’m going to raise as much money as I can for the organization that means so much to me and my family. The plan is to run a minimum of 50, 5-K races in 50 weeks. And my goal is to raise a minimum of $100,000 for Easter Seals in the process. I will be establishing a new Endowed Scholarship fund in the name of Payton J McSimov. That’s where I need your help. You can make a one-time donation, or you can pledge a certain amount for each race I run. My goal is 50 races, but I plan to surpass that and complete at least 75 races.